5.0 out of 5 starsA fantastical tale of friendship, nature magic and mysterious new worlds. "Part one: absolutely delightful. I love the magic and the young witch that Ashley has created. I love the way that Charlotte connects with nature. I love the ragtag gang of earth kids and journeying with them as they are stranded in the strange new world. So far the story feels fresh and exciting. So far the story has touched on bullying and feeling like you never fit in." I didn't take any notes after parts one and two - I was just racing through to the end. And once I got there I would have happily kept on reading. 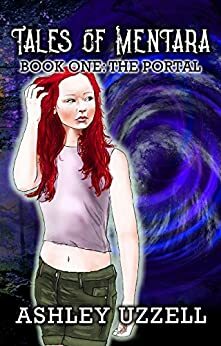 The Portal is the first book in Ashley's Tales of Mentara series, with the second installment planned for april next year (2019). The series intends to follow the main set of characters as they grow from middle graders into teens and on. In this the first book the eldest of the main characters is 12, but due to their life circumstances most of them act quite mature for their age. I actually kept forgetting that they were meant to be middle graders, I kept seeing 15/17 yr olds in my head. I am looking forward to seeing these kids grow and seeing the dynamics of their relationships change. I'm especially keen on seeing how Charottle's whitchly powers develop as she ages and what becomes of Thomas's health. Conclusion: A fantastical tale of friendship, nature magic and mysterious new worlds - best suited to the younger YA audience. 4.0 out of 5 starsExcellent Work! A group of middle school friends find themselves trapped on a strange new planet when the sorcerer of the team, Charlotte, accidentally opens a portal to the other realm. Learning to adapt to this new environment proves tough when homesickness, uncooperative allies, and the distrust of an indigenous tribe threaten their chances of survival. With the threat of another group of invading warriors looming, Charlotte and her friends have to act fast if they want to live to tell their amazing story. They’re only kids, but everybody grows up eventually, even if it is a rapid ascent into maturity. The first thing I want to applaud Ms. Uzzell on is her ability to promote five different main characters without any of them getting lost in the shuffle. This novel is relatively short, so she doesn’t have a large canvas to work with, which is what makes these characters’ developments all the more amazing. Charlotte and Lena are the motherly figures of the group while Daniel and Mindy are the innocent children and Fred is the rough and tough bad boy (but only on the outside). The more you delve into this story, the more you realize that they are just kids after all and they have their moments of raw emotions and soft feelings. That’s what makes this story real to me. It’s also refreshing to hear parts of this story told through the points of view of the indigenous tribe. Despite the language barrier and primitive lifestyle, they actually have a lot in common with the “pale-skinned” main characters. They too are just kids who want to live a normal life after the stresses of this new world break them down. This goes to show that no matter where you are in the universe, you’ll always have someone to empathize with. The more empathy you have for your fellow humans, the less likely you are to hate them. This novel could be an allegory for racial harmony if you read between the lines. And then you have the most heartbreaking part of this story, the homesickness the lead characters feel. They’ve been gone from their home world for what seems like forever and they’ve definitely earned their right to cry because of it. Earth has things like junk food, loving people, technology, and fuzzy animals. Meanwhile, this new world is in the midst of a war brewing between the indigenous tribe and much more powerful warriors called Bomen. These kids might as well have joined the Iraq War back in 2003…at their middle school age, no less. The loss of innocence makes the homesickness even harder to emotionally process. If you want to cry too, you have my permission (not that you need it). All in all, this is a fun little adventure that anybody can enjoy regardless of their generation. Anybody can appreciate the messages of friendship, loyalty, and staying strong through all of the hardships. While Fred and Mindy are hard to cheer for in the beginning, they become more sympathetic as the story changes who they are. As a matter of fact, everybody in this story will feel the change brewing within them by the time all is said and done. A passing grade for this wonderfully crafted story! 5.0 out of 5 starsA fun read even as an adult - I think the target audience will really enjoy it! Although this story was written for an audience far younger than me, I greatly enjoyed reading it; Ms. Uzzell is good at making her readers feel at home with her characters, no matter what age they are or situation they're in. I loved that the action started right away, that there were different viewpoints for me to experience the story from (especially the Orphans', which was so intriguing), and that there was still some mystery at the end - between Charlotte's unusual talents and the impending turmoil with the Bomen, there's a lot to look forward to in the next book. I think this would be a good middle-school read in particular because it deals with things kids are getting involved in at that time of their lives: different relationships, figuring out who they are and what they like, learning new things about the world, and especially feeling ostracized for one reason or another. I have a feeling Ms. Uzzell will be weaving some helpful and important life lessons into this story as it progresses (as well as tackling some deeper and more difficult issues), and I'm excited to see how it all unfolds. Whether you want to dive into a unique story for yourself or hand it off to the middle-schoolers in your family, this is a fun choice that I recommend! Uzzell’s latest work reminds me of Lord of the Flies, but in a fantasy setting. A group of children find their way a strange and wild world, both familiar and different. While some of the plants and people bear similarities to our own, gravity doesn’t work the same way on Mentara. The children are left without the guidance of adults in a brutal wilderness that has no modern conveniences. The characters are well-rounded and believable, meaning they have relateable flaws. Like real-life children, they can be funny, impulsive, whiny, and also resilient. It’s through their eyes that the reader experiences the world of Mentara. Coming from a variety of backgrounds, these children must grow up fast and learn to survive. Fortunately, there are some locals to help them acclimate to this new land after traveling there from the early 90s. Unfortunately, just as they are learning to hunt and adapting to sleeping in huts, a war is on the horizon. Uzzell has created a novel fantasy fans of all ages can enjoy. This book was a definite page turner from the start! The characters have great depth to them, and I'm very excited to read the next one. It would make a great gift for any YA reader, I would suggest around middle school age. The characters are extremely relatable. I loved it.